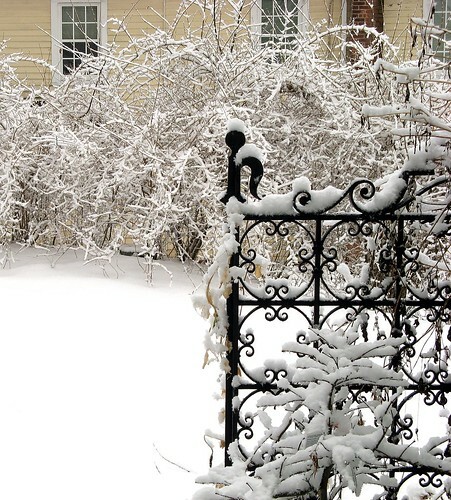 gate with snow, originally uploaded by jahansell. I haven't been blogging this month because every available minute (and there aren't many) is devoted to choosing photos, printing and framing (and all that that entails) for my show, opening in two weeks at the Sharon Historical Society. It will be up for 2 months, so there is plenty of time to come visit! I'll post the links and inform the winners later this afternoon - running to work right now! Well this has made my day Jenny, it's always difficult to get a good exposure with snow, but this looks just fine. Happy to see you back! And congratulations for this friendly award. I love the snow pic, Jenny. Good luck with your show!! Of course you will have to tell us about it when you are done and rested. HAVE FUN!! so great to see you back !!!!! good luck with your show ! Good luck in your show! How exciting. You'll be a hit. This photo is a great example. what a coincidence, I also have a show opening in 2 weeks (well the 12th actually, eek) on Historic Port Elizabeth. I will be exhibiting oils, my freind Vilia watercolours and Bob binnell, a well known local photographer vintage photos. Best of luck with yours, hope it is a winner!